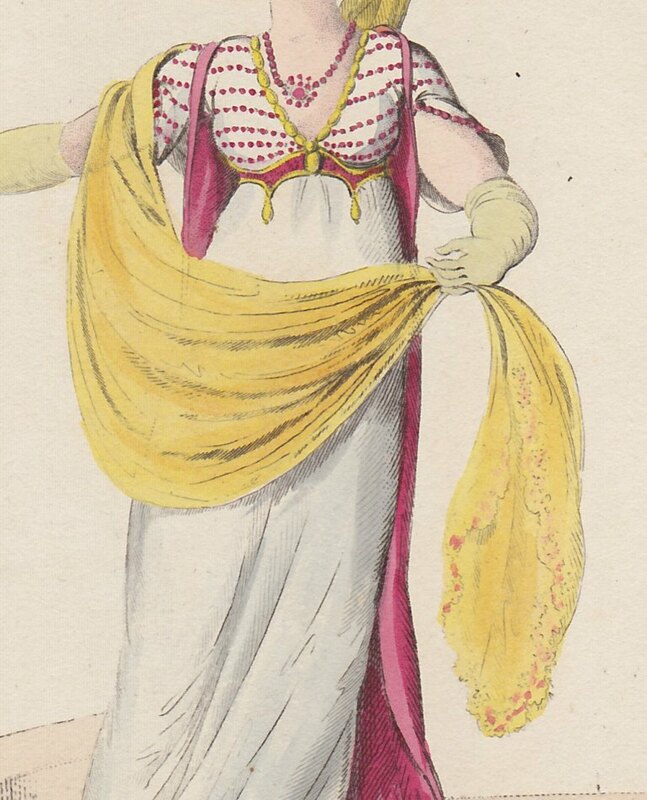 If you’ve been reading this blog for any length of time, you know how I feel about my prints from Ackermann’s Repository: they were exquisitely engraved and colored, were of uniformly excellent quality during the twenty years of the journal’s existence, and are a total delight. But that doesn’t mean one of the other great publications of the Regency era, La Belle Assemblée, doesn’t have its moments as well. 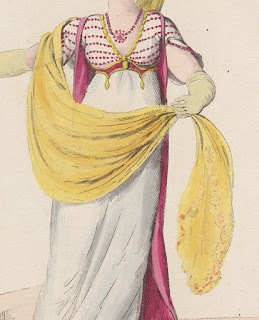 One of those moments occurred in the December 1807 issue of the magazine, with the appearance of a plate titled Full Dress for Assemblies in the Persian Style. I’ll let you admire it for a moment before we proceed. 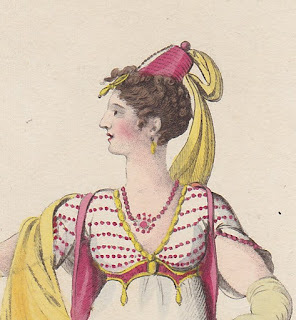 A Neapolitan robe and petticoat, of white, or coloured satin, made quite plain. Armorial vest of white satin, beaded in gold stripes. A cestus [a girdle or belt] á-la-Cleopatra, composed of wrought gold and amethysts. Hanging sleeve, gathered in front of the arm, with brooches of the same. The hair confined from the roots, the ends flowing in irregular curls, leaving the forehead and temples exposed. An Indian casque of tissue, with amethyst ornaments. 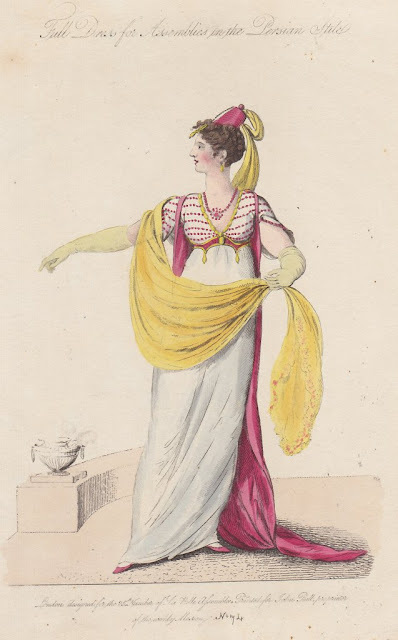 A long veil of gossamer gause, rounded at the end, and embroidered in a delicate border of silver, or silk, flowing from the centre of the crown, over the right shoulder, and forming a drapery in front of the figure by the attitude of the left hand. Pear earrings of amethyst or pearl. Necklace of pearl, with amethyst star in the centre. White satin slippers, edge with silver beading, and white kid gloves above the elbow. I can’t help wondering what held on the fez-like hat (close-up above)—presumably some description of hairpin. And it would have been remarkably tedious to have to hold onto the veil for the entire evening to "form a drapery in front of the figure." This may have been a dress to wear to balls and assemblies, but probably not one to dance in. Nevertheless, whether Persian or Parisian, it’s a delight. Would you like to have worn this one? I would not like to wear this one. It reminds me far too much of some ugly curtains I saw once and for all I am a fan of wearing whatever regardless of how much like curtains or upholstery it looks, I would not want to wear something that reminds me of ugly drapes.